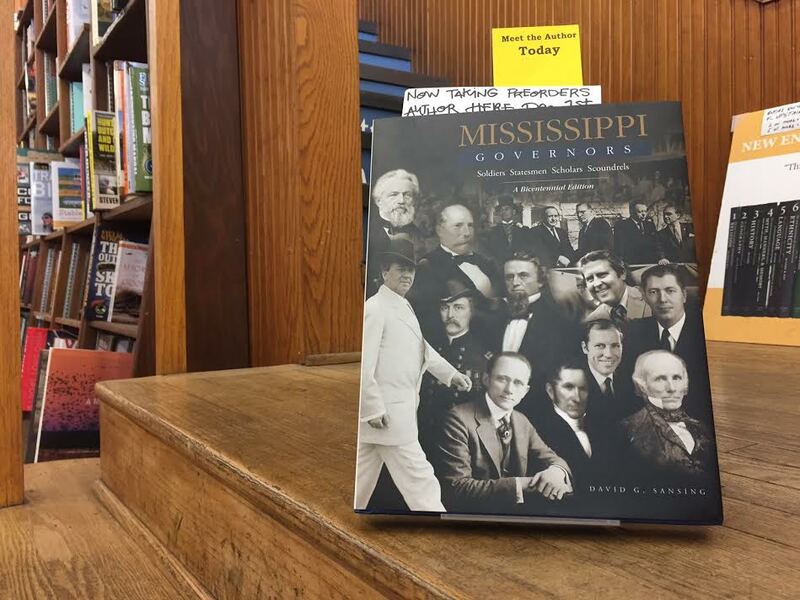 David Sansing to Sign New Book “Mississippi Governors: Soldiers, Statesmen, Scholars, Scalawags” Today At 5 p.m.
Mississippi historian and author, David Sansing, has a new book that details the lives and administrations of all 53 governors of the state of Mississippi. The book titled “Mississippi Governors: Soldiers, Statesmen, Scholars, Scalawags” is a way for Sansing to give himself and readers a way to look back on the state’s history through the lives of the 53 governors ahead of 2017, Mississippi’s bicentennial year. The storied past of the state is highlighted by the choices made by each governor during their time in office, and this book tells the stories beyond what a history book will tell you. Sansing will be at Off Square Books tonight at 5 p.m. for a book signing of this, his latest book, detailing the complicated history of Mississippi’s highest office. After co-authoring a book with, then, Governor Bill Waller’s wife Carroll, about the history of the Governor’s Mansion back in 1972, Sansing became interested in those who lived in the house. A professor of Mississippi history at Ole Miss at the time, Sansing taught the stories he compiled, but didn’t begin the writing of this book until 2013. Sansing was asked to write a short biography for each governor for the Mississippi Department of Archives and History. Realizing that there was still much to be discovered about these men, Sansing began the process of writing this book. Three years of intense research and writing, the book was completed. Mississippi’s past is unlike any other states, and Sansing has been able to study each administration’s effect on it. The themes that he saw developing were racial tensions and the importance of educating the citizens of Mississippi. Stories of governors attempting to move away from slavery to those doing everything they could to keep African-American’s from becoming equal in the eyes of the law in Mississippi are all represented in this book. A story that stuck out to Sansing was found at Mississippi’s very beginning, stemming from David Holmes. Holmes, the first governor of the Mississippi territory, gave a prophetic warning about the state’s future. Governors honored today are remembered in this book, including Governor James L. Alcorn. A white slaveowner, Alcorn worked toward the citizenship of all former slaves, and racial reconciliation across the state. Alcorn State University, an all-black university, now bears his name. Andrew Longing pushed for the end of lynchings in 1900, and the book goes into great detail about public opposition to his proposals and how he wasn’t elected to any other public office after his first term. Sansing described the countless other struggles of power from one administration to the next, eventually leading up to the Jim Crow era and the problems that ensued. Stories of African Americans fighting in WWII and returning home, only to be denied the right to vote, are included to show the states legislatures role in the beginning of the Civil Rights Movement. While strides have been made, according to Sansing, there is still work to be done. Sansing is currently a member of the contextualization committee at Ole Miss, where he ensures that history is not rewritten, rather further explained. Lamar Hall named after the man who wrote the secession letter of Mississippi, who also wrote the speech leading to the reconciliation of the Union. The speech, which was called “one of the bravest speeches ever given” by JFK, makes Lamar Hall an example of the many buildings and monuments on campus that Sansing wants people to know about. Off Square Books is located across from Nielson’s on the historic Oxford Square. The book signing will begin at 5 p.m.